Having collected her Pearl award yesterday at the age of 12 Jodie is retiring from Flyball and Agility. She has been a wonderful dog to train, and compete with and in the last two months not only ran in the Kiddy Monsters team to get those last few points to take her over the 30,000 mark but also picked up a second at the Shrewsbury Agility show. Ran in Crufts Flyball Grand Final. Ran in numerous Crufts team finals and being in the winning Kidderminster team in 2010. Won an Agility Championship in 2008. 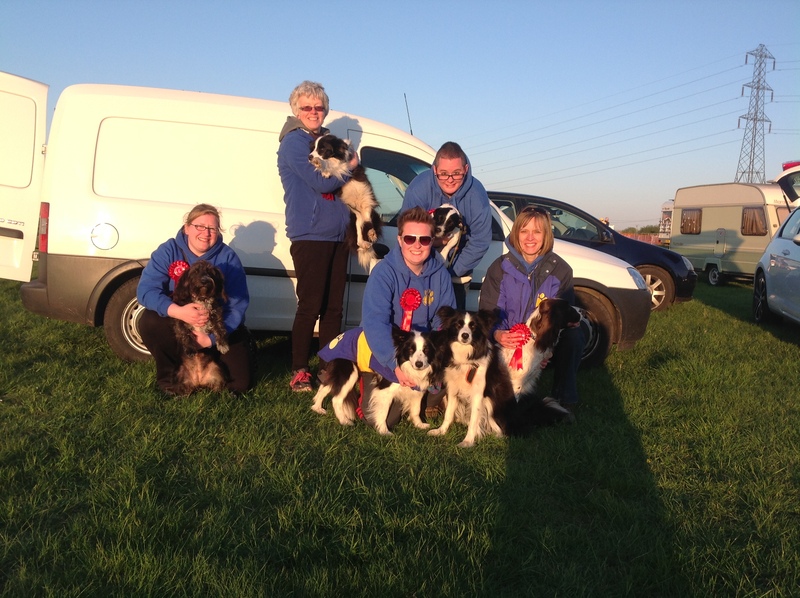 Won Division 10, 15 and 21 at British Flyball Championships. Came 6th in European Flyball Championships in Belgium in 2009. Thank you to all who have run with us over the last 10 years its been up and down at times but always a joy. Kiddy Minsters travelled to Newark today for the Extreme racers BFA Flyball show. Seeded 6th in a very competitive division 3 we started with a heavy defeat against the top seeds who went on to beat all the other teams as well. Our fortunes changed in our second match as we put in some good team runs to get our first win of the day. We then maintained our seed time of 20.48 to win the remaining three matches to finish a very creditable second in the division. The team were Louise & Stan, Laura & Marmite, Karen & Maddison, Emma & Sherlock with Stuart on box loading duties and Andy providing vocal support. During the racing Stan achieved his BFA Advanced award. Whilst in the post match presentations Jodie collected her BFA Pearl award for achieving 30,000 points. Well done to all who represented Kiddy today. Super close racing at Muswell Leys today as Kiddy Monsters won 3 of the five matches to finish 3rd in division 3. The handlers and dogs running today were Karen & Maddison, Laura & Marmite, Emma & Sherlock, Rob & Rosie and Stuart & Jodie. During racing Jodie picked up her 30,000th BFA point. She is one of only 343 dogs to win the Pearl Award and the first from Kiddy Monsters. Kiddy Monsters put on a flyball demo today at Fun in the Brum, Fernhill Heath Worcester. All the club members participated and our show was well received by the public and the organisers. Thanks to all who came and showed off how much fun can be had with your dog at flyball. Congratulations to Kidderminster agility team who today won the Crufts qualifier at Nottingham Championship show to qualify for Crufts 2016. All the dogs went clear and won by 3 seconds. The team were, Stuart & Tiegan, Karen & Willow, Sue & Spice, and Liz & Kera. Steve & Fern and Nicola & Zed will be our reserves. Liz and Kera had a particularly good weekend having also won the Championship Reserve on the Saturday. Tough days racing at Ryton today for Kiddy Monsters. We never coped well with the new NAFA race format as the long delays betweem mmatches never enabled us to get into a racing groove. Some highlights during the day were Zoe & Rosie's first BFA points, Emma & Sherlock hitting the 1000 point (Intermediate) Milestone and Rob collecting Rosies Intermediate award. Congratulations to Kiddy Monsters who won division 7 at Abingdon today. The team started as 6th seeds and won all 5 matches. The team were Zoe & Rosie, Emma & Sherlock, Louise & Stan, Karen & Maddison, Stuart & Jodie with Laura on box loading duty. 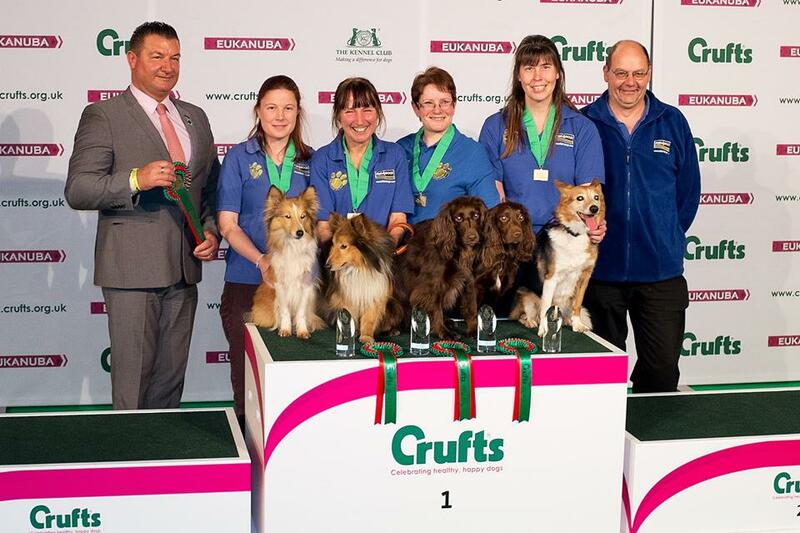 Contratulations to the Kidderminster Agility team who once again won the Crufts Medium Agility team title. The team were Liz & Kera, Sue & Spice, Karen & Willow and Heidi & Cody. This is our third title in 5 years so well done to all involved as is tradition a beer was taken to celebrate. Thanks to Fish4Dogs who continue to support the agility team. Thanks to all who attended the AGM this evening. A very good turnout from the membership and congratulations to Louise who was elected Chairman. Many thanks to Will who held the role from 2010 and his contribution to the clubs development over the last 5 years is greatly appreciated by the club committee and the club members.. The AGM will be held at the Eagle & Spur, Cookley on 26h February at 8pm. Happy New Year to all at the club, our friends and sponsors. We wish you all a great 2015.